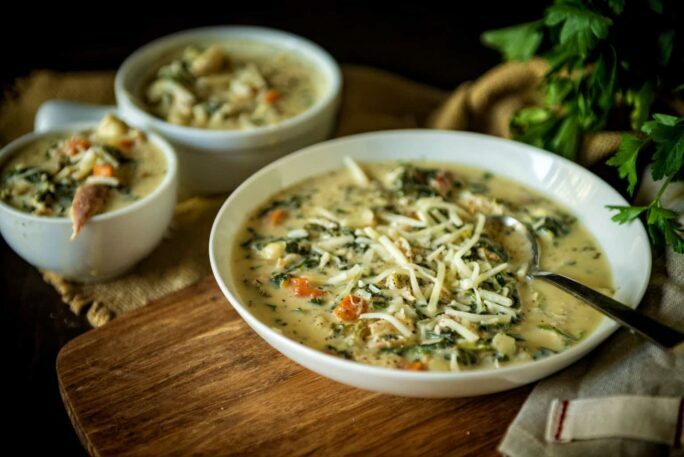 Chicken gnocchi soup is hearty and full of flavor from juicy chicken, potato gnocchi, and tender veggies. It can be made on the stove top or in a slow cooker. If you are anything like me – a quick and easy meal WINS many a night. And with this one you are guarenteed big time flavor. Because it’s a copycat recipe from America’s favorite ‘Italian’ eatery! 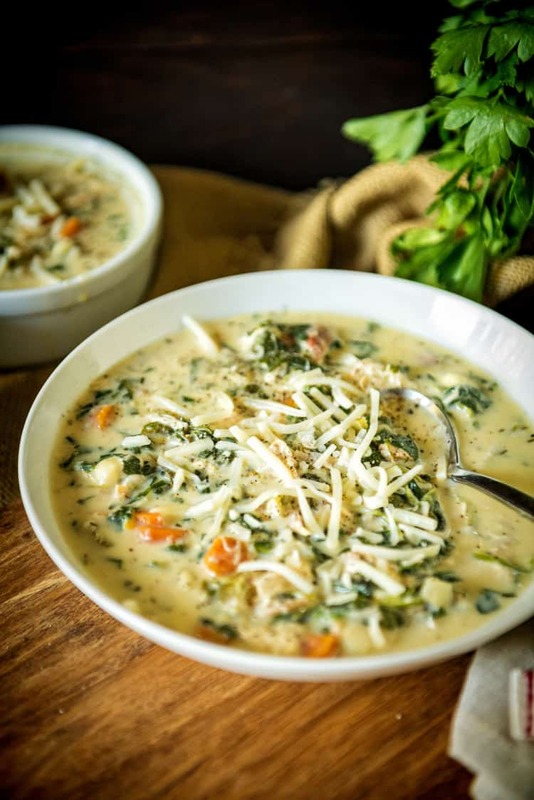 And since they do just about every single dish justice at ye old Olive Garden, this soup is no different (though I hear it’s no longer on the menu – craziness). I have tested (and lets be real, loved) a few other Olive Garden Recipes. So if you’re in need of pairings, or just other crowd pleasing favorites check out the Chicken Scampi, Lasagna Fritta (my fav), and the Copycat Spinach and Artichoke Dip too. Now, back to this soup. Because, it’s possibly the best quick fix slow cooker soup you can make. 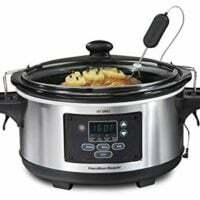 This is one of those toss things into a slow cooker, run some errands and come home to dinner done sort of recipes. It’s also a great way to use up leftover chicken. Apparently, a version of this chicken gnocchi soup used to be served at The Olive Garden. It’s since been replaced by the Zuppa Tuscano soup. Personally, I like this soup better. What is Gnocchi and where can I get it? From the comments I’ve received on this post, it seems that gnocchi is nearly mythical in some supermarkets. For clarification, Gnocchi are small and soft dough dumplings that can be made from a variety of ingredients including semolina, ordinary wheat flour, egg, cheese, potato, cornmeal, or other similar ingredients, sometimes including herbs and vegetables. Most gnocchi you are likely to find in the US is of the potato variety. As such, it is sometimes hiding in the store with the frozen potatoes and not the pasta. I would check around in the fresh and dried pasta sections, and with the frozen spuds. Otherwise, relocate to a more Italian friendly neighborhood, and you are sure to find it at a fresh pasta vendor. For me though, I would make them. This Gnocchi Recipe is pretty outstanding. And I won’t blame you if you make a double batch to have them with the short ribs and in the soup. 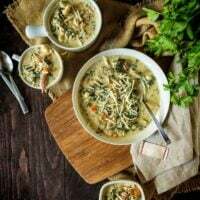 I made this chicken gnocchi soup in a crock pot and let simmer for a while, adding the gnocchi and spinach towards the end when we were getting ready to serve it. Now, I need to go stock up on some meat. Lots and lots of meat. And dust off that slow cooker. While it’s on the counter (after making this soup of course) you should go ahead and put it through it’s paces with these delicious slow cooker creations. If you’ve tried my Chicken Gnocchi Soup recipe or any other recipe on passthesushi.com please don’t forget to rate the recipe and let me know where you found it in the comments below, I love hearing from you! You can also follow along for more good eats and travel tips on Instagram @passthesushi & @girlcarnivore, Twitter & Facebook. I made this in a crock pot and let simmer for a while, adding the gnocchi and spinach towards the end when we were getting ready to serve it. In a large stockpot, saute the onion, celery and garlic in the butter and olive oil. When the onion is clear, add the flour and form a roux. Stir and cook a minute. Add the half and half. Meanwhile, in another pan, cook the gnocchi. Add the carrots and chicken to the stockpot with the roux. Stir often. When it gets thicker, add the chicken broth, gnocchi, spinach and seasonings. Cover and heat through. Hubba hubba! This looks creamy and comforting! I actually just made this exact recipe on Monday. It’s so delicious! I remember Kristen doing that soup because my wife loves it!! 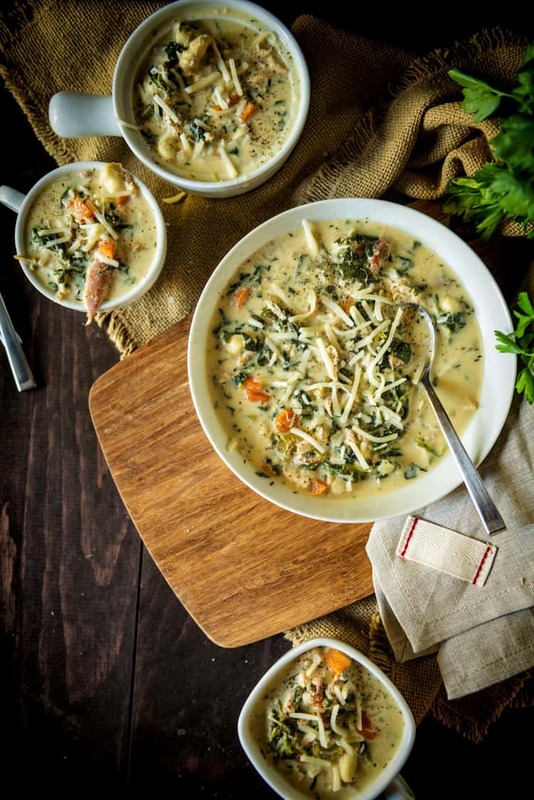 Great job recreating this delicious soup! Soup with gnocchi!!! Love this idea. It looks sooo good and comforting. 🙂 Soup is one of my favorite foods ever. Oh lucky you…that’s an awesome gift! Bravo boyfriend!!! That soup looks great! I love that it is with gnocchi…mmmm! My sister would worship me if I made her this soup. It looks awesome. I made this for dinner tonight. It is quickly becoming my family’s favorite soup. It’s good to know it can be made in the crock pot. I cannot wait to see what you do with the meat grinder. What a great gift for a foodie!!! I was actually quite panicked through the day about how the half and half would hold up in a crock pot but it turned out just fine. This is a great base that I can easily see tweaking. I think next time I’ll defiantly use kale instead of spinach because I love sneaking it in when I can and keep the chicken a little more chopped instead of shredded because I’d like the texture better. Love your blog! I was happy to see your post over at Chef Dennis’ today. 🙂 Have a great weekend! I would have been excited about that also! I got an Ina Garten cookbook and I love it! Your soup looks delicious and It was great to meet you at Chef Dennis’ today! Have a fabulous weekend! Beautiful photos! And congrats on the guest post at Chef Dennis today-how I found you. Can I come over for a bowl of this soup? Wow! Talk about delicious! And I loved to hear about your present. My husband knows that anything to do with Kitchen Aid will make me smile! You don’t know what you are missing! You can get “All you can Eat Soup and bread sticks” for around $6.00 add $4.00 more you can add all you can eat salad too. You can try all the soups they serve, or stick to one. I LOVE their Gnocchi Soup! I love all of them, but that is favorite. So glad to get the recipe. YUM! That soup looks so good . . . and the Olive Garden? Best restaurant ever! I can’t wait to try it myself. Thanks! A meat grinder. How romantic! That is awesome. Sounds like my relationship too. Flowers and chocolates? Gag me. A new pair of socks? Excellent!!! I love the Olive Garden’s chicken gnocchi soup (although I have a feeling it might be terrible for you), but I found some tiny onions in it and now have sworn it off for life. So imagine my excitement to find your recipe, where I can omit the little nasties? Thanks! What an awesome gift. I’ve been dying for a Kitchen-Aid Stand mixer with meat grinder AND pasta attachments. 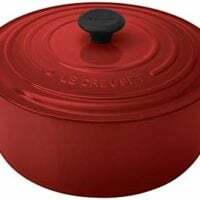 Can’t wait to see what recipes you make with it. Thank you for this delicious recipe! It was soooo yummy! This might sound like a dumb question, but where can I find the gnocchi? I’ve looked at 2 stores, so far, in the refrigerated and frozen pasta sections with no luck! I bought tortellini, but I have a feeling that won’t taste the same. Hi Shelly, I am sorry to hear you can’t find gnocchi in the frozen/refrigerated pasta section. My only other thought would be to try if you have a fresh pasta section in the deli area? Sometimes I have seen the Buitoni brand in many stores. And as a last ditch effort, I would check near the frozen potatoes, just in case. Personally, I think this soup would be rocking with the tortellini. Texture wise, a bit different, but I’ll take stuffed pasta over gnocchi any day 😉 Letme know how it all works out for you. I actually found Gnocchi at the Dollar Tree of all places! And Safeway and commissaries have also carried it. And WalMart. Usually in the dried pasta aisles, and usually on the very top shelf. Gnocchi is also not hard to make if you can’t find it in a nearby store. Made it with the cheese tortellini tonight and it was amazing! Thanks for the recipe and the advice! This soup looks amazing. And I love that it’s made in a crockpot. It makes life so much easier. All I can say is yummmm!! I made this and it was a hit with the family! We will be making it again. perfect recipe for this chilly fall day! If I make this in the crockpot should I follow regular cooking directions first or just dump everything in the crock pot? I made this last night and it was delicious! Creamy and wonderful! Thanks so much! I was wondering how long before you wanted to eat did you add the gnocchi and spinach? Thank you so much for sharing this soup recipe!! Made it for the first time today and my husband and I had our daughter and our son-in-law over to try it….it was a huge hit with everyone! I put everything in the crockpot to cook on low all day except for the spinach and gnocchi. I used a box of frozen spinach because the fresh spinach in the store looked horrible. It was fabulous! 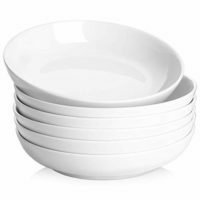 It doesn’t tell you anywhere how manybowls of soup does it make for how many people? I’m home alone for the weekend and I love expirementing in the kitchen when my parents are gone- mom is a chef so sometimes hard to work when she is home because she always wants it done her way lol. I made this soup tonight an I added red peppers and a shot of hot sauce and some grated cheese!! It was amazingly good! I made this recipe a month or so ago, and my husband and I loved it. But it was even better the second day! So this time, I am making it, letting it sit in the fridge for a night, and eating it the next day. I think the flavors work so much better after hanging out for a little while! Love it! Made this soup with boneless, skinless chicken thighs and it was even better than Olive Garden! Also make the Zuppa Tuscana and it was delicious too. Thanks so much!! How long should I leave this in the crockpot? How long is “all day”? 5 to 7 hours on low. Hope this helps! Do you just put it all in at once? Or do you cook it on the stove first? I love this recipe. Creamy and delicious, just perfect for the fall weather we are just now experiencing! I have made this a couple times and discovered it was better the second day. so now I make it late one night before going to bed, and refrigerate it overnight. The next day I heat it up for dinner and its AMAZING! If you can’t find gnocchi in your supermarket do what I’ve done out of sheer laziness to shop and pull the inside of potato rolls and roll them in your hands to make little potato dumplings. 🙂 Not the same but pretty tasty. pot u have to prep it on the stove top! Regardless my whole family loves this soup!! We all think it’s better than the Olive Garden soup. The creamy texture of the soup just made my mouth water. This was delicious! We added a few more cloves of garlic, and a few more herbs, like oregano and thyme, and it was soooo good! The only mistake we made is we doubled the recipe. Now we have soup for an army, and there’s just 2 of us. Can you freeze the leftovers?